The 16 frames all laid out on my floor. I'm going to try and hang them with sticky-back velcro so they will (hopefully) be easier to align. 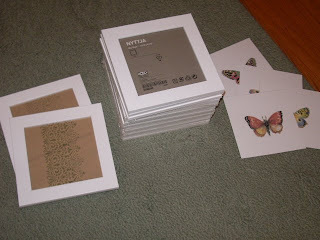 I bought some 5.5 x 5.5 Nyttja frames at IKEA ($24 for 16 frames! 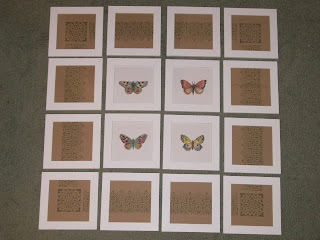 ), scoured my clip art books, did a little printing and cutting and voila, instant art. The frames still wrapped up and some trial images printed out. I created a template in Illustrator so I could print the images 2 at a time. I printed the trim marks as solid lines for easier cutting and because the picture frame border would cover any cutting mistakes. 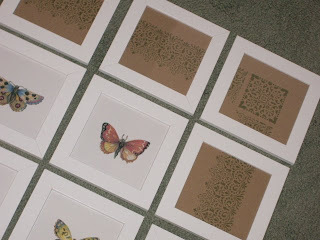 I printed the "border" on kraft paper and the butterflies on white. 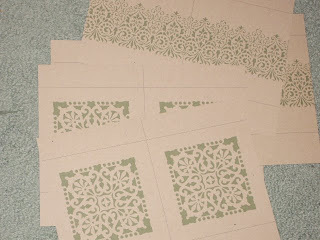 I ended up changing the corner images to include some of the border because the corners on their own (see photo 3) were to overwhelming when they were bigger.